HANDS ON Poly Canyon Ventures held its launch party on Oct. 5 at Bang the Drum Brewery in SLO to inform the public of their mission to help student startups gain footing. 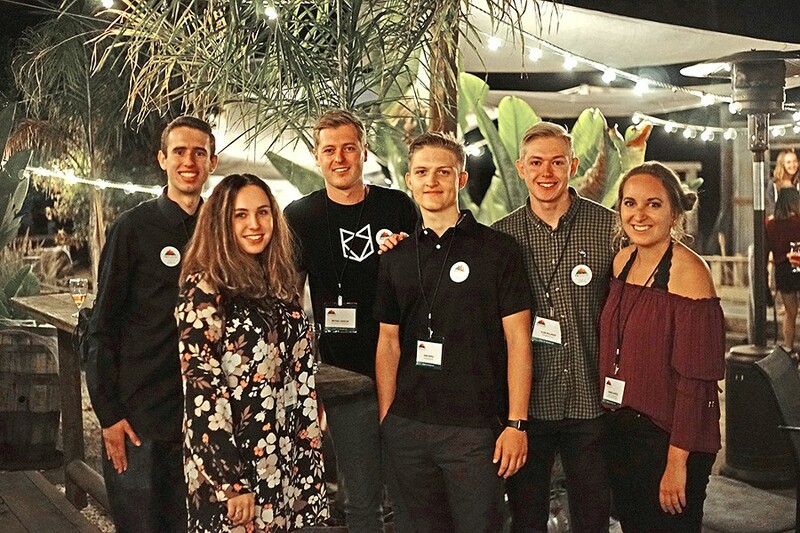 Freshly graduated Cal Poly students recently created an organization that will help current students and their startups gain access to early funding. Founder Nathan Johnson and his two colleagues met through various clubs and startups at Cal Poly—the entrepreneurship club and the inventing club, to name a few—and wondered how they could help students with innovative startups get ahead of the game. "We were also part of the Center for Innovation and Entrepreneurship program, and we all had such positive experiences with those organizations that we wanted to create something that gave back to the community and the university," Johnson said. That's how the nonprofit Poly Canyon Ventures came to be. The goals of the organization are to provide student entrepreneurs access to early stage capital and to promote socially and environmentally responsible business and investment practices. Johnson said that when he and his colleagues were attending Cal Poly, there wasn't a group or a club that exposed them to venture capital—money invested in a project, typically a new or expanding business, in which there is a substantial element of risk—or investment with private markets. "We think it's really important that students are able to learn about that in a socially and environmentally responsible way, because private investing does carry a lot of influence in our country," he said. Poly Canyon Ventures has nearly met its funding goal of $18,000, money that will go into investing in three student startups. Each will receive $5,000 to develop prototypes, proof of concepts, and incorporate their business to strengthen their chances of securing a spot on the Cal Poly Accelerator program. If selected, the startups will gain access to $10,000 in initial funding from the Cal Poly Center for Innovation and Entrepreneurship along with office space and the tools needed to launch their business. Poly Canyon Ventures' goal, Johnson said, is not only to give students firsthand experience in investment but also to give back to the community. He hopes that the startups will contribute to the local economy. "We want to be able to help the San Luis Obispo economy. By using our projections we're hoping our portfolio companies will bring in hundreds of jobs and millions in funding for SLO County in the years to come," he said. One of the investments that the organization has made is working collaboratively with SLO City Mayor Heidi Harmon on a project called the Climate Changers Fund. For a startup to qualify, it must meet two criteria: one member of the startup has to identify as female, and the business has to address a problem that could contribute to solving climate change. "As we look toward the future, we see innovation and the intellectual capital that Cal Poly creates as being key to our city's future success," Harmon said. With this investment, Johnson and his team hope to promote more people who identify as female in the business field. For more information on the organization or if you have a startup with a great idea, check out the organization's website: polycanyonventures.org. • Morris and Garritano Insurance is the recipient of Insurance Journal's 2017 Overall Best Agency to Work For award. With offices in San Luis Obispo and Santa Maria, the third-generation family-owned company has increased agency revenue by more than 62 percent over the past three years. The company has earned a spot on the Inc. 5,000's Fastest Growing Private Companies in America in August 2017, coming in at No. 4,243.